Well, it was bound to happen sooner or later right? When you screw gamers over and bleed them from the inside out, leaving a splitting hole of desperation, anger and shame staring back at everyone unfortunate enough to see the victimized core gamer bent over and ravaged on the ground, the only thing you can expect to come out of such a thing is an army of pitchforks and torches. Always count on Angry Joe to drum up the issues of a game to a point where fanboys are left frothing at the mouth and community members are reduced to a rage-induced seizure. Originally, this issue was going to be left to the holding gates of opinions and criticism, where the trusty members of Gaming Blend would wait it out and see if Sega and Creative Assembly would attempt to repair their damaged relationship with trusty gamers, and in a way, they have. However, despite Creative Assembly's attempt to announce a weekly patch update for Total War: Rome II in order to address many of the game's glaring problems, there is still yet another problem that must be addressed: the game reviews. Quite naturally a giant anvil in the form of guilt just dropped in the empty pits of some reviewers' stomachs; filling the void where it was once filled to the brim with the enthusiasm of a frisky puppy thanks to the intake of Mountain Dew and Doritos... better known as the intoxicating political party, the Doritocracy. As noted on The International Business Times (and boy do I hate their automated ads) Creative Assembly has been fighting to fix many glaring issues that large portions of the gaming community have been complaining about since launch, including connectivity issues where multiplayer becomes unplayable due to a timeout bug, the massive AI issues that Angry Joe addressed in a separate video blog (heck, you can watch it below if you're too lazy to click the link) and obvious glitches that ultimately hamper the game's playability. Now, the issues regarding the game itself are a topic all its own. If Creative Assembly is at least aiming to fix the game then they're doing some justice to the title that certainly supersedes the piss-poor efforts by Gearbox when Aliens: Colonial Marines launched, and they basically hung everyone out to dry until the pitchforks and torches subsided and then they quietly rolled out a patch big enough to be its own game. However, the bigger problem are all the glowing reviews... and glowing they are. 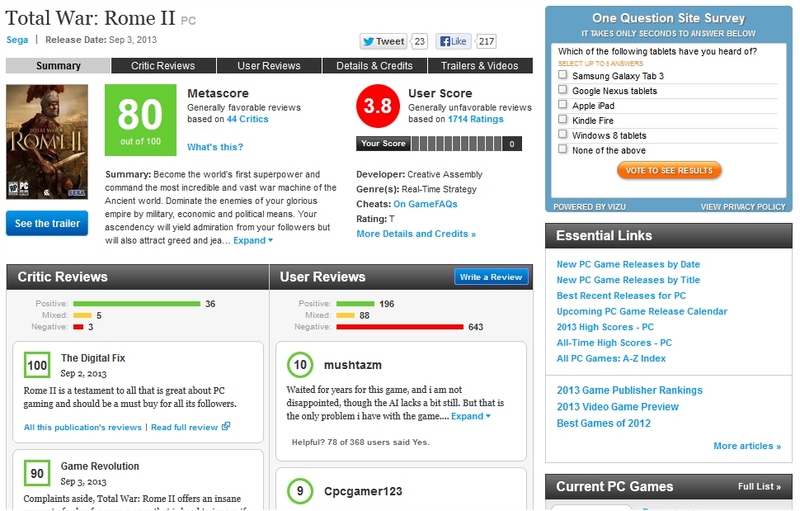 Scroll on over to Metacritic right now and check out those scores. I screen-capped it in case someone decides to try to wipe the slate clean or some BS like that, you know like with The War Z or whatever. Uh oh, look at this... look at this. What's that from The Digital Fix? Is that a 100? Is it? And it's a day before the game even launched? Are they serious? And Game Revolution... a 90? And IGN.... a 90 as well? Eurogamer... 90? Really folks? It's almost as bad as the high-praise reviews for Simcity and Diablo III, even though on day-one gamers were getting their virtual orifices gaped by publishers like a proctologist using an experimental foot-wide speculum on a patient. Most of all, the high scores came on the day the game launched. But there were already issues that Sega knew about before the game launched, with a forewarning sent out on August 27th, a week before the release of the game, notifying reviewers of some technical issues just ahead of launch. We hope that you are enjoying your time with Total War: ROME II. Before you get too far into the game and its single player campaign, we wanted to alert you to a display issue that has come to the attention of the developer, The Creative Assembly. Resolving this display issue will be particularly helpful for those who are running the game on ‘Ultra’ settings on high-end gaming PCs. For some users, unit sizes in battles are appearing as ‘Small’ even when ‘Ultra’ settings appear to be selected in your options. This results in battles appearing much smaller in scope even if your rig exceeds the minimum system requirements. This issue was present along with the AI, the graphics, the difficulty problems, the multiplayer problems and everything else compounded on the game. Now it's a minor issue, the graphics thing, but it's telling as to the fact that these reviews (especially the high scoring ones) came out the day the game launched, before the day-one patch was even issued. Do you know what that means? It means that many of the problems fixed in the day-one patch were still present when the reviewers originally played the game... … …. While Creative Assembly inevitably tries to win back fan favor while also peddling needless, stripped DLC for the game, how exactly does the Doritocracy recover from this? Do they just apologize to the Dorito Pope and say they'll play games better? Will they reconcile with fans by handing out free Doritos and Mountain Dew? I think they'll do what they always do... blame the gamer, just like with Mass Effect 3 and the people who got hyped over the previews and media assets and decided to pre-order Aliens: Colonial Marines.